Renovation / home makeover loans are a great tool for buyers and sellers. Have you ever seen a home in an awesome location but decided not to purchase because it neded to be updated or it needed a more updated floorplan, newer windows, modern kitchen or other renovations? Enter the Home Makeover Loan. This great new home loan program allows you to purchase a property AND make updates or renovations to that home. All in one closing. One loan. Done. This loan doesn’t give you a bunch of restrictions, and in many cases will allow you to extensively improve your soon to be dream home. There are a couple of things that stand out. Loan amount is determined by using the “after-improved” value. You can receive up to 50% of the amount in repair funds. In short, the property appraiser is going to take a look at the property in its current state, then determine a current market value on the property. Then they will take into consideration all of the improvements that you want to make to the property, what those improvements add to the overall value of the property, and what your home’s value is after the improvements are made. The amount that you can obtain for improvement funds is up to 50% of the after improved value. This means that if you find a property for $200,000, then want to put $100,000 in improvements to the property. The appraiser determines that your improvements to the property will yield a value of $300,000 to the property. That $300,000 is the benchmark that determines the maximum amount you can use for improvements. In this case it is 50% of $300,000; or $150,000. You are only needing $100,000 in improvements, so you’re well within in the maximum restriction. Maximum loan amount is the conforming loan limit of $453,100. This home loan program is a Conventional loan program and is restricted to Fannie Mae loan limits. That limit is currently $453,100. So, if you keep your total loan amount there or under, you’re good to go. This means a Single Family Residence, but also a duplex, triplex, or 4-plex is allowed. The possibilities are awesome! This loan is also great for Condominiums, Co-Ops, and PUD’s. 2nd homes and Investment properties are restricted to single unit SFR, condo/co-op, PUD. Renovations must be permantly affixed to the property and must add value to the home. For example: BBQ, Pools, Landscaping, new kitchens and baths, add another level or more square footage to the property. 660 FICO score or above. Shane Hollenback at Bay Equity Home Loans can help with all of your Home Makeover Loan questions. Shane can be reached at 602-690-7581. Remember, certain renovations will tend to be better than others. Paint, flooring, kitchens and baths are the most popular. For the older homes, you may want to remove popcorn ceilings. Outdoor living spaces are other popular choices. Landscaping with pavers, BBQ’s, lush vegetation all help create a better living space and a more enjoyable quality of life. Here’s an example below of a kitchen from a home built in 1966. 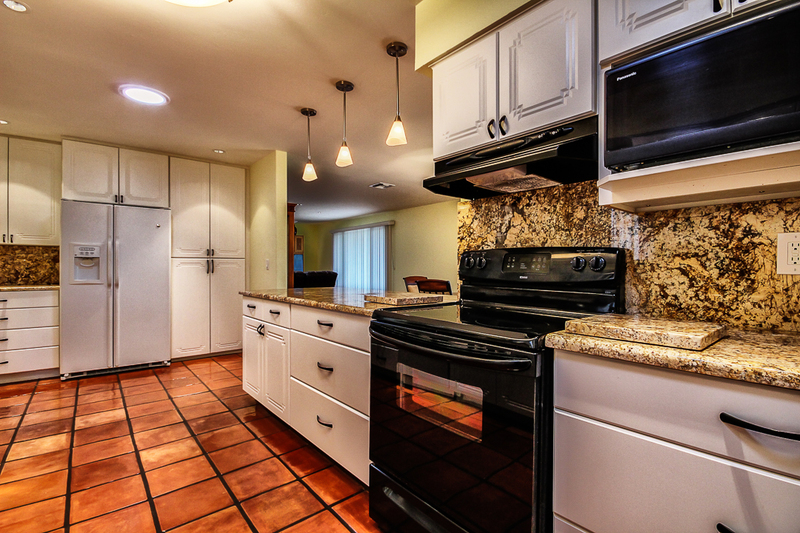 It was updated with new cabinets, new counters, fresh paint, new appliances and new fixtures. Rather than spend thousands of dollars in out of pocket expenses, it makes sense for many people to use a Home Makeover Loan / Renovation Loan to finance their upgrades. Keep your money in your pocket and finance your lifestyle into your newly renovated home. For sellers, some upfront improvements can yield a nice return. Obstacles can arise if people try to get too much for their money. Be realistic in expectations with your upgrades and updates. Areas like Tempe, south Scottsdale, Arcadia and other very established neighborhoods work really well for Home Makeover Loans but homes built just 10-12 years ago are starting to look dated and could be good candidates, as well. With few restrictions and a simple, straight forward underwriting process home renovation loans are not as difficult as people tend to think they are. You’ll want some language like “buyer intends to purchase the home using a renovation loan post closing” added to your original purchase contract. You’ll also need to add a “subject to value” clause to your offer. The repair money will be held in escrow and the contractor is paid with draws from the escrow account. More info and updates coming soon!